Bird hunting is not a competition, at least not between hunters. Sure, we pit ourselves and our dogs against the game bird in its natural habitat in a battle of the wits, which, more often than not, the bird wins. However, the hunt should never be seen as a match between you and your hunting buddy. I’m sure most agree with this sentiment. But do any of you have a hunting companion that never seems to miss, one whose competence with the scatter gun makes you acutely aware of your own shortcomings in this arena? Have any of you ever wondered what it would feel like to outshoot that person, even just one time? I did it once, and it felt great, but let me start from the beginning. I have a life-long friend named Matt Lucia, who is one of the most passionate and ethical hunters that I have had the pleasure to hunt with. You see, Matt is a game biologist by training and now a land conservationist by profession. 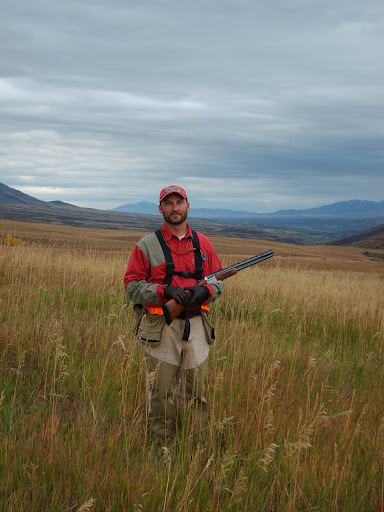 In his graduate program, Matt trapped, monitored and studied eastern Idaho’s sage grouse population and he knows and loves these precious birds (and all game birds for that matter) like none other. In my mind, he embodies what we, as sportsmen ought to aspire to be. When you are afield with Matt, he makes you want to be a little safer, a bit more aware of the importance and fragility of the game we pursue and their habitat, and he instills in you a desire to be a better steward of the land and our precious natural resources. Matt Lucia: Bird Hunter Extraordinaire. As if that were not enough, Matt happens to be one of the best shots I have ever witnessed. Over the years, I have seen him pull off some impressive feats of shooting. 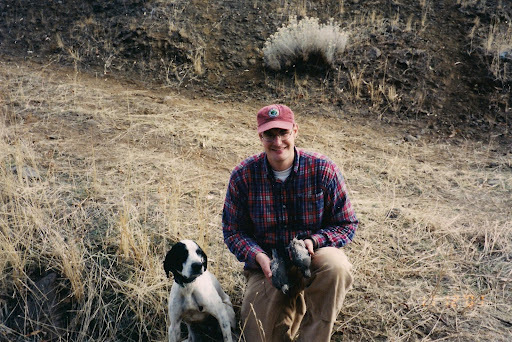 Take, for example, the time Matt and I hunted for chukars in the steep bluffs overlooking Lewiston, Idaho. As we approached some old abandoned farm equipment on the edge of a freshly plowed wheat field that September afternoon, Logan, Matt’s young black lab became unmistakably birdy. In fact, Logan’s back end wiggled as excitedly as his thick black tail. “Logan is on birds, get ready,” Matt warned. Only a few feet away from the old farm implements, a huge covey of chukars erupted seemingly darkening the sky. While I blasted holes in the ozone touching nary a feather, Matt dumped two birds with two shots with his over and under, reloaded, and dropped two more of the late risers. Simply put, I was amazed by his poise in the chaos of the rise and shooting skill on a game bird that can be very difficult to take consistently. I specifically recall that I got skunked that outing. The following season, I invited Matt to come out to hunt with me in Deary, Idaho on the awesome property I had the good fortune to live on at the time. Our quarry that fall afternoon was the elusive ruffed grouse. Matt, our dogs, and I hunted along an old logging road, which was bordered by some thick young trees and berry bushes resulting from extensive logging that had taken place years before on the property. To this day, this location had some of the best ruffed grouse habitat I have ever seen and the birds were present in astounding numbers. As we worked down the overgrown logging road, Matt veered off to the right into the thick cover when Logan showed some interest in the enticing scent blowing from this direction. Only moments later, I heard two distinct shots. “Did you get one?” I hollered. “No. . . I just got a double,” Matt answered matter-of-factly. Matt had just pulled off a feat that many hunters never accomplish in a lifetime: A double on ruffed grouse and in the thick timber to boot, and he wasn’t even that excited about it. Man, this guy is good! I thought to myself. A year later, Matt and I teamed up again to pursue valley quail in southwestern Idaho where I had a tip from a new acquaintance on a good place to hunt. 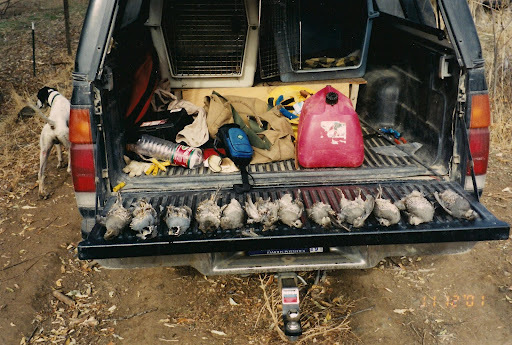 In fact, my friend bragged about flushing coveys of quail so large that he dropped six birds with one shot. Stories like these always make me a little skeptical, but even if the account was only partially true, it still might be great hunting. I called Matt and invited him in on the possible action. Upon reaching our destination, the mouth of a huge draw that extended for miles uphill with a little brushy creek trickling through otherwise desert surroundings, we split up, with Matt and Logan taking the left side of the canyon and Farley, my Elhew pointer and I, taking the right. My friend who had given me the tip and the permission had not exaggerated in the least as the draw was loaded with more valley quail than I had ever seen. Farley and I found them in all the likely places. In short, Farley tore it up that day and must have pointed fifty times. I, on the other hand, burned up a box of shells with my Remington semi-auto 12 gauge without much effect. After a lot of hiking and shooting, I only had one small female quail to show for all of the effort. A couple of miles up the draw, Farley and I worked our way up a small brushy little draw with spindly trees that were only about ten feet high, but thick and impenetrable. Below the tangled foliage was an open area, perfect for quail dusting and loafing on an Indian summer afternoon. At the base of this draw, Farley cranked down on point on a grassy clump. With plenty of flushes and shots under my belt, the usual excitement and anxiety had calmed some. When the little quail flushed over the top of the tree, I caught up with it just as it reached the apex of flight and she dropped straight down into the impenetrable foliage. To retrieve her, I had to crawl into the brush’s low opening , look up to locate the bird’s silhouette where it hung in the tree, and then reach up through the tangle to grab a hold of it, a difficult maneuver. Farles and I with my two measley quail. Farles looks as if he is embarrassed to be in the picture with me. With all the effort, I was tuckered out and Farley and I turned and made our way back down the canyon towards Matt’s truck. With two birds in the bag, I felt like I had truly accomplished something and I wondered how Matt had fared on the other side. Not long after I reached the vehicle, Matt and Logan showed up. “How did you and Logan do?” I asked. “We got our limit.” Matt responded. Now keep in mind that Idaho’s generous limit for valley quail is ten birds: That’s a lot of birds in one day. Very impressive! Although I have been close, I have never harvested a limit of quail. “How about you, did you and Farley get any?” Matt asked. 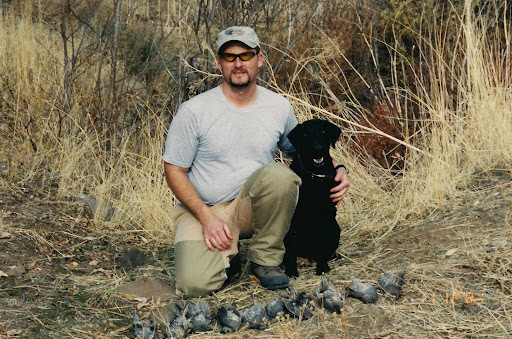 “Farley hunted up a storm, but I missed a lot of birds. We got two, ” I replied. “That’s not bad.” Matt complimented. “How well did you shoot?” I inquired. “Really well. I only shot fourteen times for ten birds.” Matt reported nonchalantly. 10 out of 14 is good shooting! I, on the other hand, was flabbergasted by his response. While I had easily missed more times than Matt had shot, he had only missed four times and had filled Idaho’s limit. Now that’s exceptional shooting in anybody’s book! Most of those birds were Matt’s . . . as usual. Previous Post FIRST DAY OF SPRING . . . WAHOOO!!! !